China warned the United States on Wednesday not to adopt punitive currency policies that could disrupt U.S.-China relations after Donald Trump’s win in the Nevada caucus. Foreign Ministry spokeswoman Hua Chunying told reporters in Beijing that "we are following with interest the U.S. presidential election." Hua was asked about China’s response to a possible Trump presidency and his announced plan to punish China for currency manipulation with a tax on Chinese goods. "Since it belongs to the domestic affair of the U.S., I am not going to make comments on specific remarks by the relevant candidate," she said. "But I want to stress that China and the U.S., as world’s largest developing and developed countries, shoulder major responsibilities in safeguarding world peace, stability and security and driving world development," the spokeswoman added. "The sustained, sound and steady growth of China-U.S. relations serves the fundamental and long-term interests of the two countries and benefits the world. We hope and believe that the U.S. government will pursue a positive policy toward China in a responsible manner." The comments came as Wang Yi, the Chinese foreign minister, is holding talks in Washington that include U.S. concerns about a Chinese military buildup on disputed islands in the South China Sea, and cooperation on dealing with North Korea’s nuclear and missile provocations. Hua said Wang and Secretary of State John Kerry agreed the two sides will enhance cooperation and increase talks and exchanges. "We stand ready to preserve and advance China-U.S. relations together with the U.S. side," she said. Kerry said he spoke to Wang about reducing tensions and finding diplomatic solutions to competing South China Sea claims. "We want there to be a halt to the expansion and militarization of occupied features," Kerry said. "Everyone benefits by true demilitarization, non-militarization." Kerry also said the United States remains committed to freedom of navigation and overflight, "something which China says it does not stand in the way of; it agrees that there should be peaceful freedom of navigation." 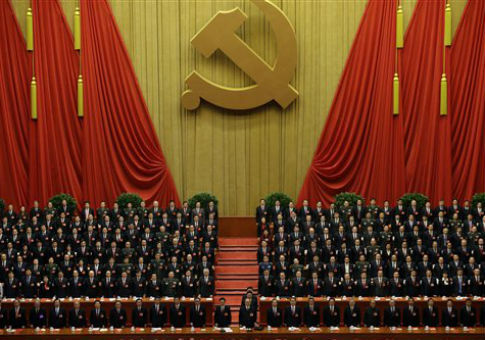 Reports from Asia say Chinese state-run media have been ordered by the Communist Party to minimize reporting on the U.S. presidential election. Hong Kong’s Chinese-language news outlet Oriental Daily reported Feb. 5 that the Party’s Propaganda Department, which sets policies for all state-run media, ordered all publications to ban election coverage of U.S. policies toward China and to focus election coverage on negative stories and scandals. Trump won the Nevada caucus with 45 percent of the vote, increasing his chances of winning the Republican nomination later this year. Last month, Trump vowed to impose a 45 percent tariff on Chinese good to offset China’s devaluation of the yuan. "They're devaluing their currency, and they're killing our companies," Trump said. "We are letting them get away with it, and we can’t let them get away with it." The Obama administration has adopted conciliatory policies toward China on trade and currency issues. Trump, on his campaign website, outlined a hardline approach to dealing with China that involves officially declaring China a currency manipulator and negotiating an end to the practice. Trump also wants to thwart China’s theft of intellectual property and adopt policies aimed at bring jobs back from overseas to the United States. Bolstering the U.S. military and "deploying it appropriately in the East and South China Seas" are other goals. "These actions will discourage Chinese adventurism that imperils American interests in Asia and shows our strength as we begin renegotiating our trading relationship with China," the Trump website states. "A strong military presence will be a clear signal to China and other nations in Asia and around the world that America is back in the global leadership business." This entry was posted in Politics and tagged China, Donald Trump. Bookmark the permalink.